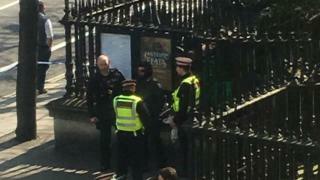 A suspected gunman has been arrested in the grounds of St Paul's Cathedral. Police - including armed officers - attended the London landmark shortly after midday. A man pointed a weapon at security staff in the Cathedral's crypts and pulled the trigger but no bullet was fired, the BBC was told. He then ran off, hiding the gun in a bush before being detained by City of London Police. The incident is not believed to be terror-related. The force cordoned off an entrance to the cathedral grounds on Paternoster Row. A spokeswoman said officers arrested a man at 12:05 GMT "who we believe was in possession of a firearm in the grounds of St Paul's Cathedral". The same man had been involved in a "domestic-related incident" where a woman was threatened with a gun in nearby Curtain Road at about 08:30, police said. Officers are not looking for anyone else in relation to the two incidents.